Long before Vogue was telling us to block our colours and colour co-ordinate our accessories with our outfits, the Queen was boldly embracing the rainbow and blocking here brights. As the Queen knows, head-to-toe colour makes the boldest impact, so be brave and embrace one colour for a style statement. It's a sad fact that millinery is not the widely art that it once was. The Queen is rarely seen without a wide brimmed hat, chicly colour co-ordinated with her different outfits. Not only do hats frame the face, they also hark back to a romantic bygone era when dressing to impress was a way of life. No-one dresses like the Queen, she is an individual with a truly unique sense of style. Trends pass her by, she know what suits her and what she feels comfortable in and stays true to her own fashion sense. Now that's the real markings of a true style Queen. She does rock a bright colour rather well! Thanks for your lovely comment in my blog! Her style is classic! Love the colors! 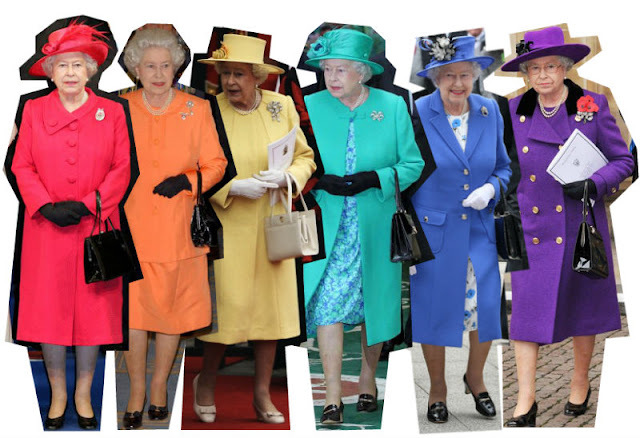 The queen is definitely rocking the neon trend very well. This is a good post! She's definitely the queen of color block.